Empower your people to bring their why to work. There’s so much evidence now that we’re entering the Purpose Economy and that meaningful work is becoming increasingly important to millions of people. A sense of meaning and Purpose is the foundation on which to build your human potential. Your people need to know why your company exists beyond a profit and they need to know why they’re turning up to work beyond a pay packet. That’s why I wrote The Purpose Project and am now excited to bring The Purpose Project Leadership Program to your workplace. 1.Employee disengagement. 74% of Australian employees are disengaged at work. 2.High employee turnover. 1 in 7 people are currently looking for another job. 3.Mental health problems. 1 in 5 people had time off work for mental health issues last year. 4.Failed change programs. 70% of culture programs fail. And...while Organisational Purpose is essential, Personal Purpose (BYO Purpose) is the place to start and that's what The Purpose Project Leadership Program is all about. I want to teach your leaders what I’ve learnt about Purpose over the last eight years so they can lead, coach and facilitate Purpose amongst your people. The Purpose Project Leadership Program is here to help your people find Purpose at work or to 'repurpose' when change is on the horizon. Let me show you how I can help you on your Purpose adventure! Explore this next great frontier where the boundaries between work and higher purpose are merging into one, where doing good really is good for business. Introducing The Purpose Project Leadership Program. The aim of this program is to give your purpose-driven leaders the knowledge, methodology and tools required to empower your people to bring their own Purpose to work (BYO Purpose) by implementing a Purpose Project. A practical, actionable, measurable way to solve your greatest people problems. A highly unique and fun approach to help your people come alive with Purpose so your company is a leading light in your industry. An understanding of what Purpose is, why we need it and how to find it. A 'before & after' Purpose Health-check to measure progress. A sense of Purpose ensures people will reach their full potential. Be the 'go-to' person for people seeking meaning. Those people leaving will feel more positive towards your company. "To be the champion of real conversations at work." Maggie brought her Purpose to life and changed the way her team connects and communicates so they bring their whole-self to work. She's now ready to lead in The Purpose Project Leadership Program. (oh, and she's no longer looking for a new job). More than just a Project. Projects are the building blocks to creating a sustainable, life-affirming Purpose. While the book and course are entitled The Purpose Project, Carolyn believes that finding and following one's Purpose, is a life-long journey and a daily practice and that projects are the most practical way to get started, particularly for employees who have never ventured onto the path of Purpose before. Projects are the best way to test, prototype and experiment with our Purpose. We learn best by doing and feeling into each project and they become building blocks for the next project. Obstacles and barriers are certain to arise as we make progress with our project, however if we can overcome them and remain committed it means we've found our path. We'll then find the courage to step up to the next level and set another project to build on the last. This offer is for 1 Purpose Leader per 50 Employees. A simple survey tool to help you measure the Purpose impact before and after the program. Access for 50 employees to the 12-lesson, 12-week online course. License is for 12 month access. See below for course content. A comprehensive facilitators guide for leaders to teach and coach employees as they proceed with Purpose. A power-packed deck of slides to help leaders make an impact when presenting Purpose to employees. Access to a hotline for trouble-shooting for leaders as you progress through the program. A guide on how to create your own 'Community of Purpose Practitioners' for support and mentoring. 8 hours of Carolyn Tate's time for consulting or private coaching on Purpose. 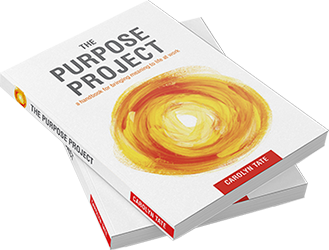 50 copies of The Purpose Project book. A copy of the e-journal to accompany the book. Access to a monthly Q&A and best-practice webinar. Access to a list of research, books, videos, articles to help further your Purpose knowledge. A certificate to award each employee who undertakes and completes the online course. To support your Leadership Program roll out, Carolyn is available to provide; Private & Group Purpose Coaching; Project Implementation Support; Speaking, Workshops, Deep Dinners. Measure it. Explore it. Name it. Plan it. Do it. Re-measure it. He left to start his own purpose-driven business and could have stayed to bring his why to work instead. Each lesson includes a short video and a downloadable PDF with tasks to complete. The lessons are supplemented with The Purpose Project book. Leaders learn how to teach, facilitate and coach Purpose, in-person and online. What can you expect in this program? Completing the Purpose Health-Check. Getting started on Purpose & Setting your Intention. What is Purpose? Why do you need it? How do you find it? Setting your intention for doing this course. What are they? How are they different? Why is Purpose at the heart of it? What's your Purpose? Discover your Purpose with ikigai. An introduction to the 'what you're good at, what you can be paid for, what you love and what the world needs' model. Going deeper on your ikigai. How do you ask the right questions to arrive at the best answer? Gaining clarity on your Purpose. Why do you need a statement? How do you craft it? How will you use it? What story will you tell? What are the 3 project options? What excites you most about them? How will you decide which to choose? Research & Testing your Project. How do you gain clarity on which project to do? How do you test the viability of these projects? What's in a project plan? Why do you need one? How do you make it simple, actionable and measurable? Who do you need to engage? What is the best way to engage them? How do you best pitch your Purpose? How do you get started and bring this project to life? How will you keep yourself on track? How do you make the time? How do you feel about Purpose now? Measuring the results and impact from lesson 1 to lesson 12. Course Overview & The Purpose Health-check. Zara was retrenched after 30 years with a global IT company. health & wellbeing of her co-workers. A low-risk, low-cost way to keep your best people. $15,000 + GST per leader for up to 50 online employee course passes with 12-month access. The Purpose Project Leadership Program is valued at over $27,850. Carolyn is offering your company the opportunity to pioneer this program with her at a cost of just $15,000. Yes, I'm interested! Contact Carolyn to make a time for a Purpose conversation. How else can Carolyn help? 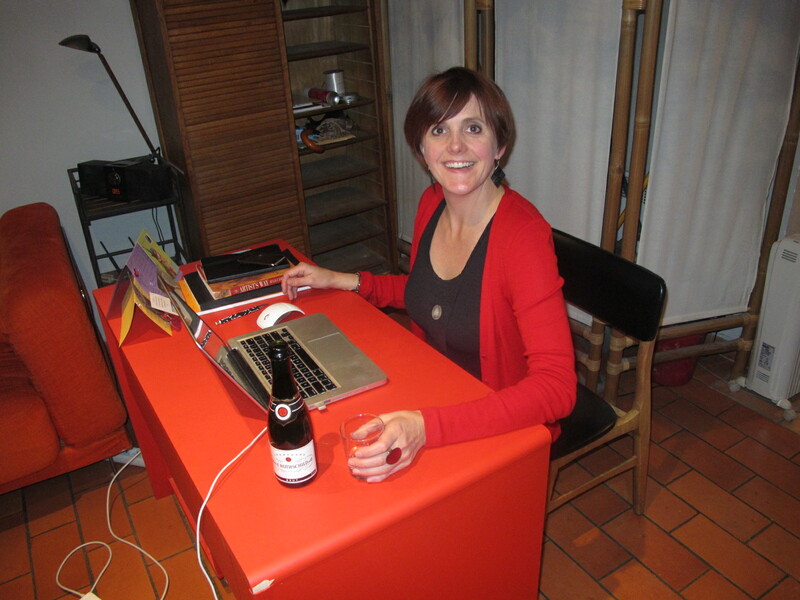 This is me on the 31st December 2010 on the last day of a 6-month sabbatical in the south of France where I wrote my travel memoir Unstuck in Provence. After 20 years at Westpac and Merrill Lynch and 10 years in my own marketing consultancy, I was burnt out and needed time out to write, recharge and reconsider my career options. It was the beginning of my own Purpose adventure. Looking back on that experience now and my whole career. I can see clearly now that I didn't have to run away to France to become an author. I learnt that I could have been a banker or a marketer AND an author. I learnt that I could have pursued my Purpose inside (and outside) of work, if I'd had the foresight, mentorship and support of my leaders. The Purpose Project is the roadmap I wish I'd had when I first started on this adventure and it's the reason I've built The Purpose Project Leadership Program. I want to help your leaders keep your best people and help them reach their absolute highest purpose-driven potential. I'm here to be a Steward of Purpose in the workplace & create a global movement of Purpose-driven leaders. Carolyn Tate & Co. is an education and publishing company dedicated to unearthing a higher purpose in people and organisations. I believe that the purpose of business is to serve the greater good and that profit is the by-product, not the single-minded goal. I'm a long-term marketer with a passion for purpose-digging, writing, speaking, teaching and community building. With a 20-year history at Westpac, Merrill Lynch followed by 17 years in my own business, I'm uniquely placed to help any company dedicated to building a “profit-for-purpose” entity. I'm a founding member of Conscious Capitalism Australia and my company is a Certified B Corporation. I'm the author of five books; Small Business Big Brand, Marketing Your Small Business for Dummies, Unstuck in Provence (a personal memoir), Conscious Marketing and The Purpose Project and I'm currently writing my sixth book - a novel. I can't wait to help you get started on the path to Purpose. It might just be the most personally and professionally rewarding project you'll ever undertake. What are you waiting for?